• The “Eagle Steam Packet Company” formed. They operated from Gravesend Town Pier to Hungerford. • A hoard of 522 Saxon coins (dated 814 - 898 AD) found near the cemetery at Gravesend. • Zion Methodist Chapel built at Shorne Ridgeway. • Mechanics Institute founded (represents the first adult working class education). • Rosherville Pier Company formed. 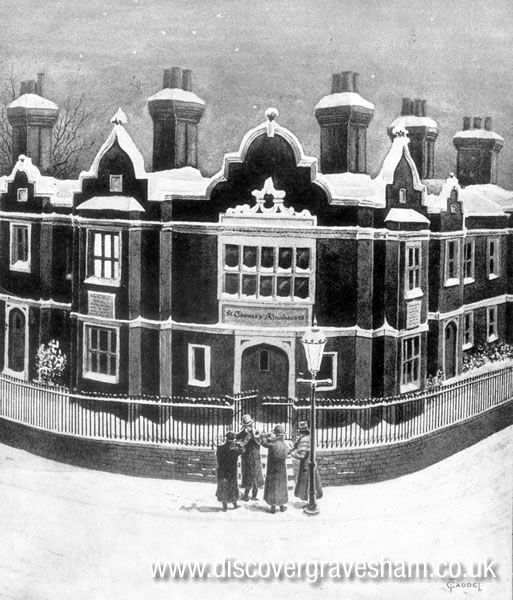 • Northfleet’s first National School, St. Botolph’s, built beside the “Dove Inn” on the Hill. • The Star Company appointed pursers to collect fares - some captains resigned and formed a one-boat company “The Sons of the Thames” which was later to become the Blackwall Company. 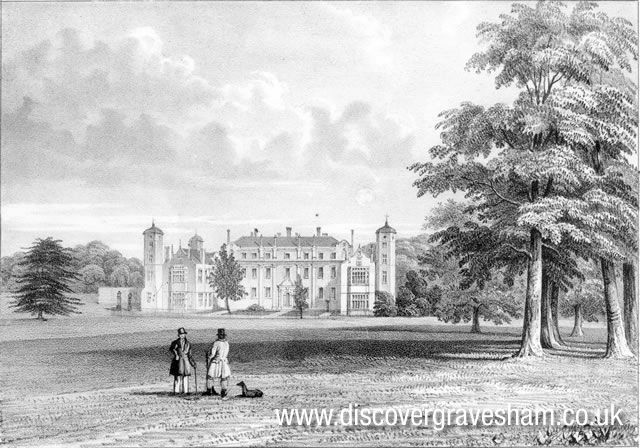 • Gravesend and Milton Cemetery consecrated by the Bishop of Rochester in February. The first burial took place on 26th of March (William Clark). • Act of Parliament to amend the powers for paving, cleansing, lighting, watching and improving the town and parishes of Gravesend and Milton. • The Blackwall Company had three boats operating from Terrace Pier. • It was recorded that over 1 million visitors landed and embarked during the year. • “Thames” (1285 tons) was one of 6 ships completed at Pitcher’s Dockyard. • Population of Gravesend and Milton 15,665. Population of Northfleet 3,621. • Land procured for a new gas works east of the town. • Milton Chantry prepared for the reception of troops from abroad. • Queen Victoria passed through the town on a state visit to the Duke of Wellington at Deal. • A permanent Terrace Pier was built. 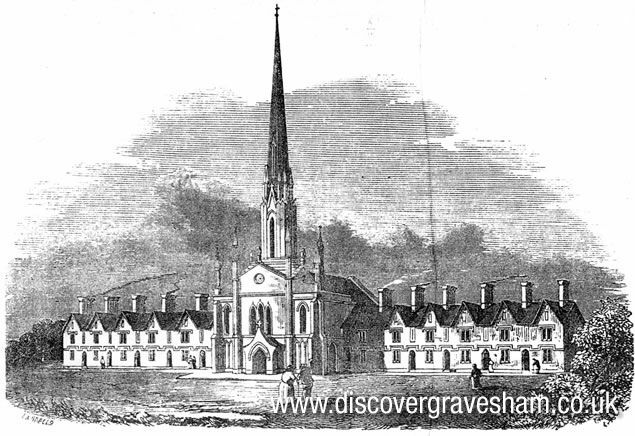 • St. John’s Chapel purchased by the Reverend Blew, who ministered until 1851. • Zion Chapel, Windmill Street, erected by John Gould, builder whose son was the architect. • The Corporation purchased part of Windmill Hill at public auction. • Richard Dadd (artist) murdered his father in the grounds of Cobham Park. • A dancing academy opened at the Literary and Scientific Institution. • Gravesend & Rochester railway opened. The railway was laid along the towpath and through Higham tunnel, a distance of 2 miles. The first train ran at Christmas. The railway rendered the canal less viable. • The South Eastern Railway Company obtained permission to extend the London and Greenwich line to Gravesend. 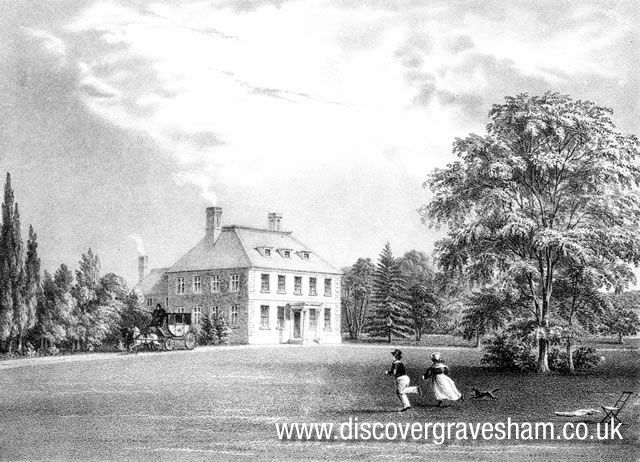 • Tom Adams laid a wicket in the grounds of a large mansion named Ruckland House. (See 1905) The Ground later became the Bat & Ball ground. Cricket matches began to be played there regularly. • Big fire destroyed the “Black Horse” and much of the west side of the High Street . The “Black Horse” was later rebuilt. • The building formerly called Clarendon House was opened as the “Clarendon Hotel”. Clarendon House had been built as a residence for James II when, as Duke of York, he was appointed to the office of High Admiral. He married Anne, daughter of the Earl of Clarendon. Hence Clarendon House. • First Town Regatta held. This became an annual event, which continues to this day. • A dry dock 500 feet x 74 feet added to Pitcher’s Dockyard. • A disastrous fire in West Street and High Street. 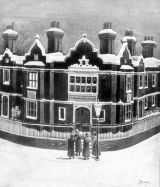 The Pier Hotel burnt down also Talbot, where the Lodge of Freedom lost its furniture. Jury Street was constructed as a result of the fire. The name commemorates the fact that a jury sat to assess the amount of damage. As a result of this incident the Corporation established a proper fire brigade. • Dr. Adam Park (brother of Mungo Park the explorer) died. He was in charge of the East India Company’s Hospital, Sussex Place and surgeon to the workhouse. • William Aspdin came to Northfleet and began the manufacture of Portland Cement. • Brunel’s “Great Western” docked at Pitcher’s Dockyard and again in 1851. • Huggen’s College, Northfleet, founded in 1844 by John Huggens of Sittingbourne, completed with 40 almshouses for the elderly poor. The first eight residents were welcomed. • The telegraph station at Gad’s Hill was closed down. • Wycliffe Church, Perry Street, opened. • A Chinese Junk the “Keying” arrived at Gravesend in March, after a voyage of 477 days from Canton. The vessel was the first junk to sail round the Cape of Good Hope. • Borough Quarter Sessions established as an outcome of an application for a separate court at Gravesend. • Higham Village School opened. • Corporation chattels, including the mace, councillor’s robes and furniture at Town Hall and Town Pier seized by the Sheriff’s Officer, following an action brought by Mr. William Woods, builder of the Town Pier in 1834, who was still owed part of the money due. He and some other creditors were later paid, and the chattels recovered. • Inaugural first class cricket match played at the Bat & Ball ground - All England v. Kent. • New Post Office at 151 Milton Road. • Northfleet Congregational Church opened in Dover Road at a cost of £798. • A dispensary was established at 133 Milton Road. • A disastrous fire in the High Street area spread rapidly to both sides of the street. The London & County Bank was destroyed. Troops from Tilbury helped fight the fire alongside fire brigades from Dartford, Rochester and London, together with the Towns own fire brigade. The total loss was estimated at £80,000. • Cobham Cricket Club founded by Hon. Henry Bligh (brother of the 6th Earl of Darnley). Matches were played in the grounds of Cobham Park. • St. John’s Chapel sold to Cardinal Wiseman for use as a Roman Catholic Church. • “Orinoco”, the largest ship to date, launched at Pitcher’s Dockyard. • Sheriff’s officers seized the fire engine, councillor’s robes, handcuffs, old armour and the mace, following legal action. The Corporation later signed a deed to hire them back. • Gravesend Corporation took over the lease of the southbound ferry from the Board of Ordnance. The ferry was then leased to a Mr Tisdell, a member of the Corporation. • The Diamond Company withdrew steamers from the Terrace Pier until the Corporation reduced pier tolls from a penny to three farthings. • Population of Gravesend and Milton 16,633. Population of Northfleet 5,038. • “Resolution” (collier brig) run down by “Harbinger” at Northfleet. The wreck formed an obstruction and was blown up. • Bank Street opened up between the High Street and Queen Street, being named after the bank which was destroyed by fire in 1850. • First British School, which was an elementary school for non-conformist children, was opened in Peacock Street. It contained a library and a bank and was later privately owned and became Smith’s modern school.